If there is one adventure we like to take pride in it is Costa Rica rafting. 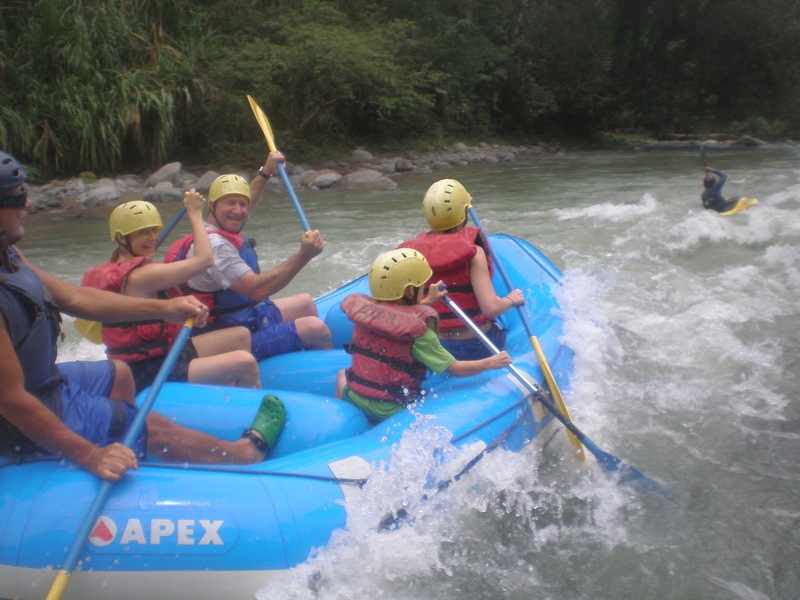 Most of our tours and adventures take part in the sport of white-water rafting during their stay in Costa Rica. Costa Rica is made up of mountains, rain, and no snow which make it a year long rafting paradise. When rafting is mentioned one of the first rivers that has to come into mind is the Pacuare River. This is an amazing river rated by National Geographic as one of the top 5 rivers in the world. The word "Pacuare" is an Indian name given by the nearby Cabecar tribe which live on the river banks. If a group is able and physically fit we always try and gear their trip around a Pacuare adventure. The commercially rafted part of Pacuare is spectacular but if you make the right contacts with some guides you might be able to run the upper section of Pacuare in the dry season which is usually operated only by experts and guides. There are many different rivers to raft in Costa Rica but Pacuare I must say is the best by a long shot. Some of the other popular rafting rivers are Savegre on the Pacific Coast, Rio Toro in the northern part of the country, and Sarapiqui River which unfortunately has taken a hit due to the earthquake a year ago. The types of rivers you will see in Costa Rica are considered technical rivers. A technical river means that you can see many rocks on the surface and that the river is usually narrow (an example of a non-technical river would be the Nile in Africa. You can take the raft through the rapids straight down the middle and you will never feel a rock). The technical river is good and bad for a guide. It is excellent training for the guide because they are always making decisions of lines to take in a rapid and comand after comand of which way the group needs to paddle. On the other hand it can become difficult for a guide and it takes more time to train on such rivers than on non-technical rivers. Just for the record I have heard that Costa Rican river guides are some of the best you will find for two reasons. The first being that you can raft Costa Rican rivers 12 months a year and a lot of these guides are no the river 6 days a week all year. The second reason is that they are trained on these very technical rivers. If you happen to travel through Costa Rica looking to raft you might want to check out the Pacuare river. Do keep in mind that in Costa Rica there are many non-commercial rafting rivers that are absolutely amazing but just take knowing the right contacts to get to run them.